The Master System sometimes feels like Sega was struggling to make something that stood out from the NES lineup. 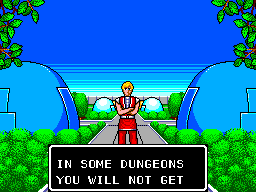 Phantasy Star was the system’s RPG. It came out in 1987, and was wildly popular enough to merit sequels on the Genesis. The game begins with a cutscene. 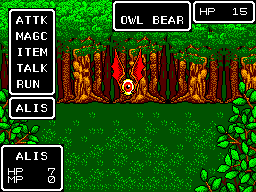 Even today if you play Phantasy Star, it’s hard to imagine that it’s not a Genesis game. While it does show simplicity, it covers them surprisingly well. In the first minutes of the game, you see the unusual domed architecture of the buildings and there’s a cutscene showing the death of Alis’ brother. You’re quickly given a quest (find Odin), and introduced to your heroine. Alis talks to a townsperson. Wandering around town, the game showcases the simpler ‘walk in front of me’ style conversations, but it also loads sort of a cutscene while you talk to people as shown above. Notably, there’s several people supporting Alis’ quest and saying that they understand that she has to get revenge. While there's not much to explore in the towns, it is colorful. The town is a futuristic mix of buildings, and includes the typical shops and inn equivalent. A moving walkway connects certain towns. 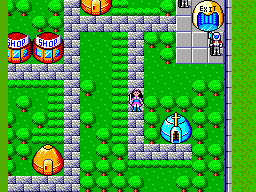 While you can’t explore the grass or do much more than talk to people, there is a style of the town that emphasizes the futuristic flavor of the game. At the end of this passage, there is a turn to the left. Like many games of the era, Phantasy Star is grindy. You will be spending a lot of time fighting to gain levels and money so you can progress through the game. It is unusual, however, in how it handles the dungeons. 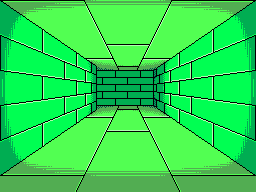 Dungeons in the game are 3D style mazes with smooth walking and turning animations as you explore. Mazes vary in colors as you progress through the game, and can become incredibly complex. 3D mazes appear in several different games, however the turning and walking animations means that the exploration feels more fluid and immersive. In the forest near town, a dangerous enemy attacks. Plotwise, I’d say the setting is novel, and the heroine is novel. She’s an empowered and powerful heroine, even if there’s not a lot of dialogue to paint her characterization. Your other characters are similarly simply done. You can save someone from being trapped in stone, or refuse to feed a cat-like creature to a mad scientist. Still, at it’s core, the charm of the plot is mostly in the exploration. Mostly, you’re fetching an item or travelling to a place where you can find out your next roadblock. Still, if you’re enjoying the journey, you’re paying more attention to your slowly growing power and the new places you can go. 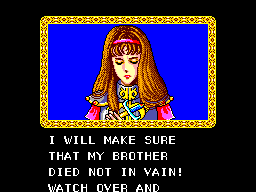 All in all, Phantasy Star is ambitious. The maze like dungeons showcase some fancy graphical tricks, and the music is outstanding. You have an unusual heroine and a competent plot. Many games of that era have a lot of grinding to progress, and Phantasy Star offers that in spades. Still, the far future flavor of the world is pretty consistently noticeable, giving the game a memorable flavor.